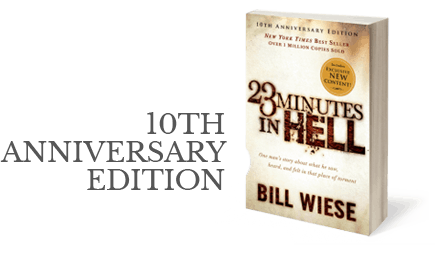 This is a synopsis of the message “23 Minutes In Hell” preached by Bill on October 29, 2014 at Calvary Christian Center in Ormond Beach FL. On November 23rd, 1998 I had an experience that changed my life. It doesn’t matter if you believe my experience. What matters is that you check out what God has to say about hell and avoid it just the same. This was not a near death experience. This was an out of body experience that’s classified as a vision in the Bible. In 2 Corinthians 12:1-2 Paul, when he was caught up into heaven in a vision, said whether in the body or out of the body he didn’t know. Well, the Lord showed me that I had left my body. So in a vision you can actually travel, like Paul and John traveled to heaven. In Ezekiel, chapter 8, he was picked up by his hair and was carried from Babylon to Jerusalem. You can actually travel in a vision. The things experienced in a vision are just as real as they would be in your physical body. You can travel in your spirit body. 1 Corinthians 15:44 talks about a natural body and a spirit body. Job 7:14 says, “You scare me with dreams and terrify me through visions.” So you can have a terrifying vision. Isaiah 21:2 says, “he was given a grievous vision.” In Job 4:14 Eliphaz was given a vision that caused his bones to shake. You can have a grievous, terrifying, bone-shaking vision. This is not to compare my experience with any of the great men of the Bible. I’m just trying to give you a scriptural basis of how this can occur for a Christian. You might say, “Bill, I’m a Christian. I’m going to heaven. Why do I need to hear about hell?” Well, here are three quick reasons; 1. When you understand how severe hell is, you’ll be much more appreciative of your own salvation and from which you were saved from. 2. It causes us all to walk more in the fear of the Lord. Proverbs 16:6 says, “By the fear of the Lord men depart from evil.” What is the fear of the Lord? Deuteronomy 6 and Deuteronomy 17 say, “The fear of the Lord is to read His word and to obey His word.” It is to have enough respect and awe for God that we will obey Him. That’s what the fear of the Lord is. 3. It causes us all to have more of a passion for the lost and a desire to witness. In Corinthians 5:10-11 Paul said, “Knowing therefore the terror of the Lord, we persuade men.” When you understand how severe hell is, you’ll be more persuasive with men. You’ll want to take that effort to witness because God’s heart is for people to be saved and go to heaven. God wants us to have His heart and to share the gospel with people. Not to force it on anyone, but to share truth with people. We went to a prayer meeting Sunday night, just like every Sunday night. There was nothing unusual about the night. I have never studied the topic of hell. I have never gone to dark movies. I never drank. I’ve never taken drugs and I’ve never had a vision before. We came home and my wife and I went to bed. I got up at 3 o’clock in the morning to get a glass of water. Suddenly, I was pulled out of my body, like being drawn up out of your body. I found myself falling through the air down this long tunnel. I landed in an actual prison cell in hell. There were stone walls and bars. It was a filthy, stinking, dirty prison, but like a dungeon. Isaiah 24:22 says, “And they should be gathered together as prisoners, or gathered in the pit, and shall be shut up in the prison.” Proverb 7:27 mentions “going down to hell to the chambers of death,” where chambers means inner rooms. Job 17:16 says, “They should go down to the bars of the pit.” I could give you many scriptures on that. That’s where I first found myself in this prison cell. The first thing I noticed was an intense heat. It was so far beyond the ability to sustain life. I wondered how could I be alive in this place? I wanted to get up, but I tried to move and it took so much effort. There was no strength in my body. But see Isaiah 14:9 -10 says, “Hell from beneath is moved to meet thee at they coming.” They would say, “Art though become weak as we?” Psalms 88:4, “I am counted with them who go down into the pit. I am as a man that has no strength.” One of the things you endure in hell, for all eternity, is you’re completely void of any physical strength. See, Acts 17:28 says, “In Him we live and move and have our being.” Even movement comes from God. It’s not automatic. I looked up and I saw these two enormous creatures in the cell. They were demons pacing like vicious, caged animals. One was reptile-like in appearance with bumps and scales all over the body. It had a huge jaw, sunken in eyes and claws about a foot long. These particular two were about 12 or 13 feet tall. It’s not an exaggeration. I can give you a scripture for that but we’ll keep moving. They were blaspheming and cursing God. They had an extreme hatred for God. We know blasphemy comes from the demonic realm (Revelation 13:6, James 2:7 and others). Then they directed that hatred that they had for God towards me. I wondered, “Why? What have I done to them?” The one demon picked me up, threw me into the wall and my bones broke. I collapsed on the floor. I couldn’t believe this was actually happening to me. Why am I not dead? The other demon picked me up, dug it’s claws into my chest and tore the flesh open. It just hung like ribbons. This was actually happening. I thought, “This couldn’t be happening.” I noticed I had a body. Matthew 10:28 says, “Fear him who is able to destroy both soul and body in hell.” Remember in Luke 16, the rich man. He lifteth up his eyes. He wanted a drop of water to cool his tongue. He had a tongue, he had eyes and he had a mouth to speak. You have a body, but it withstands these torments. I noticed there was no blood or water coming from the wounds. But Leviticus 17:11 says, “the life of the flesh is in the blood.” Well, there’s no life in hell so there’s no blood. Zachariah 9:11 says, “thy prisoners out of the pit where there is no water.” There’s not one drop of water in hell. These demons have no mercy over you whatsoever. Psalms 103:17 says, “The mercy of the Lord is upon those that fear Him.” Well, they don’t fear Him in hell so you don’t have that benefit. About this time it went dark. I believe it was God’s presence there to illuminate it so I could see, but then He withdrew His light. It was pitch black in hell. Lamentations 3:6 says, “He hath set me in dark places, as [they that be] dead of old.” Jude 13 mentions blackness of darkness forever. It wasn’t just dark. You could literally feel the darkness. That’s not an exaggeration. Exodus 10:21 mentions a darkness that may be felt, because the evil and wickedness in this place just penetrates through every cell in your body. I was taken out of this prison cell and placed over next to this large raging pit of fire. This pit was about a mile across, with flames raging high up into this open cavern. It wasn’t metaphorical or allegorical flames. It was real, literal fire. Psalms 11:6 says, “Upon the wicked He will reign fire and brimstone and a horrible tempest.” Matthew 13:49, “Angels will severe the wicked from the just and cast the wicked into a furnace of fire.” There are many scriptures on fire. This is where I could first see people inside this pit. People were burning and screaming. I know this is awful to hear about. Most of us have never seen a person on fire, unless you’re a fireman. The flesh was hanging off their bones. People were screaming, and the screams were so loud, you wanted to get away from the screams but you can’t for all eternity. You have to endure that. Isaiah 57:21 says, “There is no peace, saith my God, to the wicked.” There’s no peace of mind of any kind in hell. I wanted to let my wife know where I was at, but I understood I’ll never get out. I’ll never get the chance to say goodbye to her. That thought alone was extremely tormenting. That you could never say goodbye to your loved ones and they don’t know that you still exist. Death does not mean cease to exist. Death means separation from God. You still exist. You’re just down deep in the Earth. I understood I was down deep in the earth. I descended to get there. I ascended when I left. More importantly, there are 49 scriptures that talk about where the current hell, or Sheol, is located. I’ll just give you two; Ezekiel 26:20 and Numbers 16:32-33. It is very clear that it’s down deep in the earth, but I understood that. I understood there were different levels of torment and degrees of punishment. Remember Jesus said in Matthew 23:14, “You shall receive the greater damnation.” Inferring there’s a lesser damnation. Or Matthew 10:15 which says, “it shall be more tolerable for Sodom and Gomorrah in the day of judgment than for that city,” inferring there’s a less tolerable. Hebrews 10:29 says,”How much worse of a punishment suppose it shall be for you. You who have trodden underfoot the Son of God.” There’s a worse punishment. My point is there is no tolerable, comfortable level in hell. Any level is horrendous beyond anything your mind can even conceive. I wanted to talk to a person, just anybody. There is pleasure in conversation and being with people, but you’re kept apart. Even when I saw those people in the pit literally burning through the flames, you’re kept at a distance. You never have any conversation. You’re isolated and alone for all eternity. That alone is enough to bear. You have no purpose and no destiny. It’s just a complete useless waisting away. Ecclesiastes 9:10 says, “There’s no work, nor device, nor knowledge, nor wisdom in Sheol.” Ecclesiastes 6:4 says, “Your name is covered in darkness.” So it doesn’t matter if you’re somebody famous here. No one will know who you are there. You have no identity and you understand you’re not getting out. Job 7:9 says, “He that goes down to Sheol shall come up no more.” You understand there is no one coming to rescue you. The stench in hell is so fowl and putrid, the worst odors you can ever imagine. Worse than any open sewer. Remember Jesus rebuked the fowl spirits. Mark 9:25 says demons have a disgusting fowl odor to them. Also, there is a smell of burning sulfur. If you ever go to Hawaii to the volcano, they have signs posted that tell you you cannot go beyond a certain point because of the toxicity of the burning sulfur coming up. It will kill you if you breath it. It’s called sulfur dioxide. Sulfur is just another word for brimstone. The word brimstone is also in the Bible. You’re breathing in this fowl, putrid, disgusting air that you don’t want to breath. It’s even worse than that because there’s not enough air to breath. You have to fight for even the tinniest bit of oxygen. You feel like at any moment you’re going to die of suffocation. Isaiah 42:5 says, “The Lord gives breath to the people upon the earth.” You’re not upon the earth. You’re down deep beneath the earth. God’s very specific with His word. You need to sleep in hell. I was only there 23 minutes but it felt like I was there 23 weeks without sleeping. You know if you stay up for two nights without sleeping, you can’t function. Well, in hell you need to sleep also, but you never get to sleep so it gets progressively worse. Revelation 14:11 says, “And the smoke of their torment ascends up forever and ever and they have no rest day nor night.” Now that primarily means no rest in the torment, but no rest of any kind because Isaiah 57:20 says, “The wicked are like the troubled sea that cannot rest.” You know the sea is always moving. Rest is a blessing from God. Psalms 127:2 says, “The Lord gives His beloved sleep.” You’re not his beloved, so you wouldn’t derive that benefit of sleep. Standing next to this large pit of the fire, I could see demons were shoving people in. People were burning. You’re totally helpless. You can’t fight them off. They have great strength and you don’t. I was standing beneath this tunnel and all along the walls were demons, twisted, deformed and grotesque. Some were only 2 and 3 feet tall. Some were 12 and 13 feet tall. And there were snakes all along the edges. I could only see along the edges and through the flames. It’s so dark in hell, it consumes the light. I was standing on a bed of maggots. Solid maggots crawling allover everything. Remember Jesus said, “Where their worm dies not” and He uses the word maggot. He is saying “their” as in you have your own personal maggots. People have them crawling all over them. I know this is disgusting, but I just want you to get this picture so you understand and have the heart desire to go and witness to people and not see anybody go to this place. Isaiah 14:11 says, “Where the maggot will be spread under thee and the worm will cover thee.” Again there’s the word maggot, in the original Hebrew. I didn’t know this, but if a dead animal is being eaten by maggots, when the flesh is consumed from the animal, the maggots die. I never knew that, but they’ll die after they consume the flesh. That’s why Jesus said, “Where their worm dies not” because the flesh is never fully consumed in hell. Job 24:20 says, “The maggots will feed sweetly on thee.” Is that disgusting enough? You’re hungry but you never get to eat in hell. You experience hunger and thirst. You remember the rich man who wanted a drop of water? Thus to give you a drop of water, that wouldn’t suffice. Would it? You wouldn’t rely on one drop, but in hell you would. You’ll do anything for just one drop of water, but you’ll never get that drop. The fear level you experience is so far beyond anything you can imagine. All of us have experienced some kind of fear in life. I just want to share with you an experience I had, so you can relate to the fear that is felt in hell because we’re sitting here where it’s nice and calm. You’re not getting this. Just to share with you an experience that I had. When I was 17 years old, I used to surf a lot. I grew up in Fort Lauderdale, Florida. We used to surf on Cocoa Beach. There were about 100 guys out one day. It was a big day. We were all having a great time and suddenly the guy next to me got his leg torn off by a shark. Now there was a frenzy of sharks. The paper said they were tiger sharks. There was blood all over the water. I remember, I was on a 9 foot board and I got up on my knees as the shark passed under my board. It was longer than the board. It came back and bit my board in half. Now I was swimming in the water with my buddy. He was knocked off his board too. Then the shark came back and grabbed my leg and pulled me down under the water. Now you can imagine the fear I felt at that moment. Right? You can kind of relate to that. I can tell you in life there’s not much more fearful than that. Well, that fear that I felt at that moment paled in comparison with what you feel in hell. It won’t even register. Psalms 73:18-19 says, “You cast them down into destruction where they’re utterly consumed with terrors” and this terror lasts for all eternity. Praise God. God had mercy on me. The shark opened its mouth and let me go. That’s a miracle of God. It’s a miracle. Even more of a miracle, I looked and I didn’t have a mark in my leg. That’s impossible. Once they grab your leg, you know it pierces it. God was really watching over me then and I was not even a Christian then, but I got saved immediately after that, praise God. Thank God for His mercy. Then I said, “Why would God make such a horrible place?” Well, He explains why. Jesus said in Mathew 25:41 that hell was prepared for the devil and his angels. He never intended for men to go to this place, it was prepared for the devil. He uses the word “prepared” the same way it’s used in John 14:2 where He goes to prepare for us a place in heaven or make it ready. What He did in the preparation was, you see in James 1:17 says, “Every good and perfect gift comes down from above from the father of lights.” All the good we enjoy in life comes from God. It’s not automatic. In the preparation, He just simply withdrew His goodness or His attributes. If God removes Himself from a situation, all the good goes with Him. You can’t have the good without God. You can’t separate the two. If you’re a person in life that says, “You know, I don’t want anything to do with God,” well fine. There’s a place prepared that has nothing to do with Him. Can you see that? Other than one thing, the fire in hell does represent God’s wrath. Also the scripture says He’ll pour out His wrath on sin in the form of fire. But God poured out that wrath on Jesus on the cross so we wouldn’t have to take that wrath. You can either let Jesus take it or you can take it. It’s your choice. As I was looking at all of this horror, something began lifting me up this tunnel. It was pitch black. All of a sudden, this bright light appeared. I knew immediately who it was. I didn’t see His face. I just saw the outline of a man standing in a bright, pure, holy light. Like no light I have ever seen and I just called out His name. I said, “Jesus!” He said, “I am.” When He said, “I am,” I went out. I passed out. I don’t know if I died or what happened. I can only explain it through Revelation 1:16. John, when he saw Him, said His countenance was bright as the sun and, “I fell at His feet as one dead.” Well, after a time, He touched me and I came to. And it hit me so strongly that because He went to the cross, I didn’t have to go to that horrible place. Thank God for the cross. My second thought was, “Lord why didn’t I know you?” He had blocked it from my mind that I was a Christian. He hid that fact from me. You might say, “Bill, where is that in the Bible?” Luke 24:16, John 20:14 and Luke 18:34 are examples where God hid something from their minds. Just so you understand the reason He blocked it from my mind. If I was there as a Christian, which I was but I didn’t realize, I would have known He would be getting me out of there. However as an unsaved person, He wanted me to experience what they would feel…Hopelessness. None of us in life here know what it’s like to be hopeless. Because even if your situation is so dire, you can always die to get out of the pain. But in hell, you can’t get out of the pain. I really want you to get this for just a few seconds to understand what it’s like to be in agony and hopeless. No one is going to get you out. There is no Calvary coming over the hill. No angels. You’ll never ever get out of this place. Isaiah 38:18 says, “Those who go down to the pit cannot hope for the truth.” We know Jesus said, “I’m the way, the truth and the life.” They have no hope for Him because it’s too late. That’s the worst part of hell, understanding you’re not going to get out. Now you say, “Bill I’m a good person. I’m not going to go to this horrible place. How can a loving God send a good person to hell?” Well, God doesn’t send anybody to hell. I’m going to explain that in a minute. But, there are two reasons good does not get you to heaven. Number one, your understanding of good and God’s understanding are two different things. James 2:10 says, “if we offend His law in one point we’re guilty of all.” If we steal one thing, if we lie once, if we have one lustful thought … that all excludes us from heaven. There’s even a scripture from Proverbs 24:9 that says, “Even the thought of foolishness is a sin.” If we have one foolish thought our entire life, we are excluded from heaven. That’s a pretty high standard, isn’t it? None of us can stand before a holy God and say “Hey, I’m pretty good let me in.” He’s going to say, “No, not according to my standards. You’re not good.” Job 15:16 says, “Man is so filthy. He drinks iniquity like water.” Thank God it’s not based on being good. It’s based on our relationship with Jesus Christ. Amen. You see, God offers to be our father throughout our whole life. He offers time and time again. People push Him away, reject Him and say, “I don’t want Him in my life.” He offers to be our Father. See, God is our creator. He’s not our Father until we invite Jesus to be our savior. Then He becomes our Father. Then we have the privilege of living at His house. Otherwise, you don’t know Him. You have no relationship. Galatians 3:26, John 1:12, John 8:44, Romans 9:7-8, John 17:9, all explain that He’s your creator. He’s not your Father until you invite in Jesus as your savior. He says, “Well, you Christians are narrow minded. You think you’re the only ones that’s right and I think all roads lead to heaven. That’s what I think.” I said let me give you another analogy, which God gave me. I said, “Say you invited me over to dinner to your home and you said ‘Bill I want you to go south on highway 95, turn right at main street, go up the hill, you come to my house. That’s the only way to get to my house.’ And I said to you, you know what? I think I’m going to go north highway 95. I’m going to get off at beach boulevard because I think all roads lead to your house. That’s what I think. Well, if you don’t listen to me Bill, you won’t get to my house. I’m trying to give you clear directions to my house.” It is the same thing with God. He gives us clear directions to His house. I think God knows where He lives, right? All we have to do is follow His clear directions and we’ll get there. That’s not narrow minded, that’s specific. He’s being specific. He’s trying to get us to His house, not keep us out. There are clear directions to heaven. John 3:36 says, “He that believes on the Son has everlasting life, but he that believes not on the Son shall not see life but the wrath of God abides on him.” You have to believe on the Son. How do you do that? Just two verses. The first is, Luke 13:3 were Jesus said, “Unless a man repents, you shall all like wise, perish.” What does repent mean? Repent means to turn away from a sinful lifestyle and follow Jesus. It’s not enough to mentally assent to the fact that Jesus is God and say “Well, I can believe that. I believe He’s God,” and then go on living a sinful lifestyle or doing whatever you want. That’s not repentance. Repentance means you’re humble enough to admit, “Hey, I’m a sinner. I don’t want to sin any more. I want to follow Jesus.” You agree to turn away from sin. On your own you can’t resist sin, but when you are born again, God gives you a new nature and the grace and ability to resist the sin. But right now you just have to be willing to turn away from it. Number two, Romans 10:9-10 says, “If you confess with your mouth the Lord Jesus and believe in your heart that God has risen from the dead you shall be saved.” You have to believe in your own heart and confess Him with your own mouth. That’s the only way you can be saved. Jesus said in John 14:6 “I’m the way, the truth and the life. No man comes under the father but by me.” You want to live in His house, you do it His way. There’s only one way. You say, “Bill I just don’t believe that.” Well, then there’s a verse for you. Revelation 21:8 says, “Whosoever is not found written in the book of life was cast into the lake of fire.” God has a book and on judgment day He’s going to look to see if our names are in His book. You know when the Titanic set sail, there were all different religions and all different walks of life. And they say there were three classes of people on the ship: the lower, the middle, and the upper class. After the Titanic went down, at the Star Line office in Liverpool, England, there were two signs posted. The people would wait anxiously each day as a man would come out to write their relative’s name on one of the signs. One sign said “Known to be saved” the other one said “Known to be lost.” Now when the ship left, there were all different regions, all different beliefs and three classes of people. But the end there was only two. You’re either saved or you’re lost. It’s your choice. My question for you is, “Do you know if your name is written in His book?” You have to be certain on this one. Please don’t take a chance with your soul. Whether you believe it or not, your soul is eternal because we’re made in God’s image. You’ll spend your eternity in heaven or hell and heaven is not our default destination. There needs to be a purposeful act on our part.